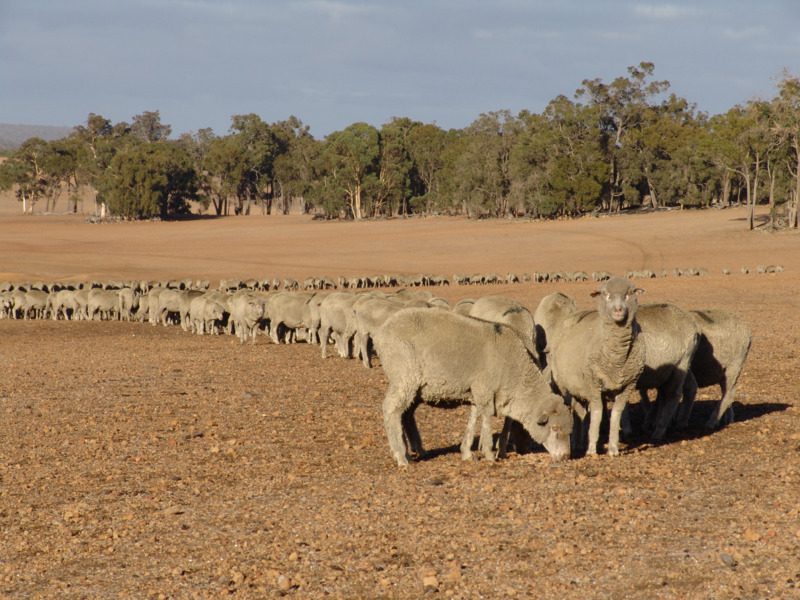 At times such as during drought, sheep and cattle are subject to dramatic loss in body condition due to reduced feed intake. As animals lose condition, their general health, fertility and ability to rear young suffers. There is also a substantial decline in carcase and production value. As animals fall to body condition score 1.5 or less, their strength and ability to withstand the rigors of transport are greatly reduced. If they lose condition further they are at risk of dying. It is not acceptable to allow livestock to reach this condition or to transport weakened animals. Decisions about feeding and whether animals are fit for transport need to be made by livestock managers, advisers and transport operators. Decisions also need to be made regarding humane destruction on the property if warranted. These are difficult decisions and place the people making them under a great deal of emotional stress. The below figure shows the key sites for assessing an animal’s status. Use Table 1 to decide on the status of animals and the action required. Lean but strong and healthy and with limited muscle wastage. Reduced reproductive performance likely. Significant muscle wastage. Unlikely to conceive. Able to recover in time if adequately fed. Weak, with very low body reserves. At risk of death from cold, wet weather or other stress. Recovery dependent on high quality care and will be slow. Visible. Spines of backbone identifiable. Spines of backbone easily identifiable. Slightly visible individually, more so in Merino sheep. Prominent and very sharp to touch. Very prominent and easy to see individually. Slightly sunken. Sunken. Deeply sunken to the bone. Rump muscle concave. Muscle wastage in loin and leg muscle evident. Obvious over whole body. Rump and leg muscles deeply concave. Individual bones just able to be felt. Bright, alert. Able to stand but listless, dull. Lacking energy, dull and listless, may be recumbent. Normal gait. Mobile, able to lie down and rise but may have some difficulty. Unsteady gait, may drag feet or 'teeter'. Difficult to lie down and rise. Some assitance required, high possibility of losing lamb during birth or on first day after birth. High possibility of pregnancy toxaemia and/or hypocalcaemia. Separate pregnant animals within this condition score range and care for and feed a high energy supplement separately. Necessary to seek advice on adequate feeding from a professional (for example veterinarian, development officer). Will need a lot of assistance - ewe and lamb may not survive. Extremely unlikely that lamb and ewe will survive lambing. Suitable for transport and sale but within minimum time off feed. Unsuitable for sale through saleyards or transport over long distances. Must be fed adequately to prevent further weight loss. Suitable for transport to agistment. Suitable for sale but must not be kept off feed or water for extended periods. Supervise and be ready to assist during lambing - supervise lamb after birth. Must be fed adequately immediately to prevent weight loss. Not suitable for transport over long distances. Very high level of care and nutrition required or destroy on farm. not possible to transport, sell or feed due to circumstances. ​Condition score 1 sheep may also need to be destroyed when treatment, transport or feeding is not possible. Sheep must not be allowed to starve to death. This information has been adapted from Industry and Investment New South Wales (NSW) Primefact 1003, Welfare decisions for Sheep by Jane Mason, Livestock Officer (Sheep and Wool), Orange.